سبحانی, حسن, درودیان, حسین. (1395). ارزیابی توجیه‌پذیری خلق پول به وسیله سیستم بانکی در نظام بانکداری اسلامی. اقتصاد اسلامی, 16(64), 31-54. حسن سبحانی; حسین درودیان. "ارزیابی توجیه‌پذیری خلق پول به وسیله سیستم بانکی در نظام بانکداری اسلامی". 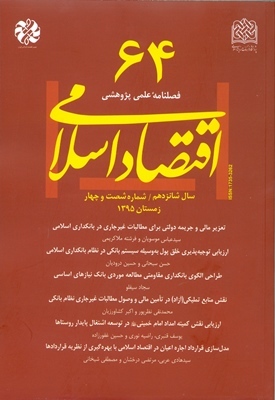 اقتصاد اسلامی, 16, 64, 1395, 31-54. سبحانی, حسن, درودیان, حسین. (1395). 'ارزیابی توجیه‌پذیری خلق پول به وسیله سیستم بانکی در نظام بانکداری اسلامی', اقتصاد اسلامی, 16(64), pp. 31-54. سبحانی, حسن, درودیان, حسین. ارزیابی توجیه‌پذیری خلق پول به وسیله سیستم بانکی در نظام بانکداری اسلامی. اقتصاد اسلامی, 1395; 16(64): 31-54. قابلیت خلق پول به وسیله بانک‌های تجاری، این سؤال را به‌ وجود می‌آورد که آیا این پدیده از دیدگاه ارزش‌ها و اهداف اقتصادی اسلام قابل دفاع و تأیید است؟ مخالفان خلق پول بانکی آن را ضد ثبات، نقض‌کننده اصول اخلاقی، ناعادلانه، ناقض قدرت دولت در اعمال حق حاکمیتی انتشار پول و محرک فعالیت‌های فاقد اولویت اجتماعی معرفی کرده و مدافعان بر مزایای آن به‌ویژه فراهم‌سازی اعتبار برای بسط تولید پافشاری می‌کنند. The money creation by commercial banks, raises the question whether this phenomenon is defensible and vindicable from the perspective of economic values and goals in Islam? Opponents of bank money creation introduce it as an anti-stability, violator of ethics, unfair, violator of state power in exercising its right to publish money and stimulator of no priority social activities while defenders emphasize on its advantages especially in providing credit to expand production. Christian scholars unanimously believe that the bank money creation in terms of compatibility with the religious criteria is not acceptable. The dominant tendency among scholars in Islamic economics literature implies that money creation by the banking system is not acceptable too. This study by emphasize on the two main criteria of justice and productivity, introduce the flexible creation of money by the banking system as a potential instrument in order to expand production and realization of the goal of prosperity while its actualization depends on the effective factors of credit allocation. From the perspective of justice, banking money creation is not acceptable due to the reliance on discriminatory rates as well as negative distributional effects, in both senses of equality of opportunity and equality in results. Thus the alignment of banking money creation and economic motives of religion involves various considerations such as designing mechanisms for consistency of bank credit with social priorities, decresing negative effects of distribution, and finally redefining the contribution of government (society) in benefits of money creation and its taxation. موسویان، سیدعباس؛ طرح تحول نظام بانکی: اصلاح قانون و الگوی عملیاتی بانکداری بدون ربا؛ تهران: پژوهشگاه فرهنگ و اندیشه اسلامی، 1390. کرمی، محمدمهدی و محمد پورمند (نبی‌زاده)؛ مبانی فقهی اقتصاد اسلامی؛ تهران: سازمان مطالعه و تدوین کتب علوم انسانی، قم: پژوهشگاه حوزه و دانشگاه، 1390. میرمعزی، سیدحسین؛ نظام اقتصادی اسلام: مبانی، اهداف، اصول راهبردی و اخلاق؛ تهران: پژوهشگاه فرهنگ و اندیشه اسلامی، 1390. Al-Jarhi, Mabid; “Banking Crises:What Chicago And Islam Have in Common:A Comment”; Islamic Economic Studies, 11 (No. 2), 2004. Basu, Santonu; “The Role of Banks in The Context of Economic Development with Reference to South Korea and India”; in A Handbook of Alternative Monetary Economics, edited by Philip Arestis, Malcolm C. Sawyer, Edward Elgar, 2006 . Coughlin, Charles E.; Money! Questions and Answers; Royal Oak, Michigan: The National Union for Social Justice, 1936. Croitoru, Alin; “Schumpeter, J.A., 1934 (2008), The Theory of Economic Development: An Inquiry into Profits, Capital, Credit, Interest and the Business Cycle: A review to a book that is 100 years old”;Journal of Comparative Research in Anthropology and Sociology, 3 (No 2), 2012. Fahey, Denis; Money Manipulation and Social Order; Dublin: Browne & Nolan, 1944. Fisher, Irving; 100% Money and the Public Debt; CreateSpace, 1936. Greenham, Tony; Ryan-Collins, Josh; Werner, Richard; Jackson, Andrew, Where does money come from? ; London: New Economics Foundation, 2012. Hasan, Zubair; “Money creation and control from Islamic perspective”, Munich Personal RePEc Archive; MPRA Paper No. 28366, 2011. ________; “Credit creation and control: an unresolved issue in Islamic banking”; International Journal of Islamic and Middle Eastern Finance and Management, 1 (No. 2), 2008. Hulme, Anthony; Morals and Money; London: St. Paul Publications, 1957. Ingham, Geoffrey; The Nature of Money; Cambridge: Polity Press, 2004. ________; Capitalism; Cambridge: Polity Press, 2008. Khan, M. S.; “Islamic Interest-Free Banking”; Staff Papers 33, International Monetory Fund, March, 1986. Lau, J.Y.F., and Smithin J.; “The role of money in capitalism”; International Journal of Political Economy, 32, 3, 2002. Mangla, I. U. and Uppal, J. Y.; Islamic Banking: A Survey and Some Operational Issues; The International Institute of Islamic Thought, 1990. McConnachie, Alistair; “How Publicly-Created, Debt-Free Money Addresses the Islamic Concern about Interest”; Available at http://prosperityuk.com/2013/04/how-publicly-created-debt-free-money-addresses-the-islamic-concern-about-interest/, 2013. North, Gary; Honest Money; Ft. Worth, Texas: Dominion Press, 1986. Pettifor, A.; “The Power to Create Money “Out of Thin Air”: A Review Essay of Geoffrey Ingham’s Capitalism”; Policy Research in Macroeconomics, January; London. Available online at www.primeeconomics.org, 2013. Rothbard N. Murray; The Mystery of Banking; Ludwig von Mises Institute, Auburn, Alabama, 2008. Sani M. Dangulbi, Arfah Salleh, Ahamed Kameel Meera dan A. Aziuddin; “Fractional Reserve Banking and Maqasid Al-Shariah: An Incompatible Practice?”; May 31, Available at SSRN: http://ssrn.com/abstract=2071164, 2012. 26. Werner, Richard; Dyson, Ben; Greenham, Tony; Ryan-collins, Josh; “Towards a Twenty-first Century Banking and Monetary System”; NEF & Possitive Money, 2011.